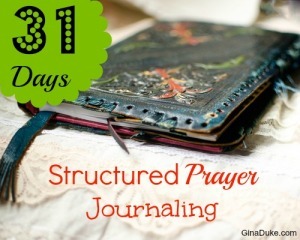 So, what is structured prayer journaling? Most people who journal or prayer journal use a free-hand method where they write about what comes to their mind and is on their heart. Every entry can be different, as some days you may hash out a problem while the next day you may celebrate a happy moment. I would say that it is more of a moments-based approach. Structured prayer journaling is formatted in such a way that it focuses everything toward God’s viewpoint and priorities. It is less about what I am doing, thinking and trying to solve, and more about what God is doing and wants to do in my life, which is a more holistic approach of my relationship with God. Not that it doesn’t address those things I am pondering, for it certainly does, but structured prayer journaling captures those things through the context of God’s movement in my life. This is what makes it such a powerful prayer discipline. Did I cover everything? I think so. Perhaps you may have another category that would be helpful to you? I will provide more details about each of my compartments (sub-categories) in future posts. Tomorrow I will be sharing how important structured prayer journaling really is. It will give you an ah-ha moment! 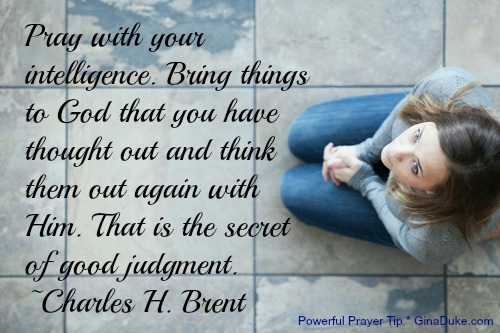 I enjoyed both of your posts you shared on a writing a structured prayer journal. Mine is not quite a detailed as yours, but I really like how you laid it out. I have a hard time sticking with the consistency of doing it, but when I do I see such a benefit in all areas. Makes me wonder why I don’t work harder, right? :) Prayer is as essential as breathing, it fills my wings and bouys me up to meet the day. I probably find myself just resting in Him, consistently, as my morning starts. It quiets my heart and direct my feet so that I can be a prayer-warrior when the day starts. Thanks for sharing! Good luck on your 31 days of posting on the blog. Thanks, Dawn. Glad to meet another prayer journaler. I have to admit that I’ve been a little light this week as we have been vacationing with family for a wedding. With all of the pre-wedding festivities, 31 Days of writing and just spending time with our family, I’ve had a hard time being as diligent with it. But when that happens, I don’t sweat it. I am still praying just as regularly, but maybe not making as many journal entries. I plan to take a time of reflection when I get home and catching up. Hope you continue to tune in for my remaining posts!